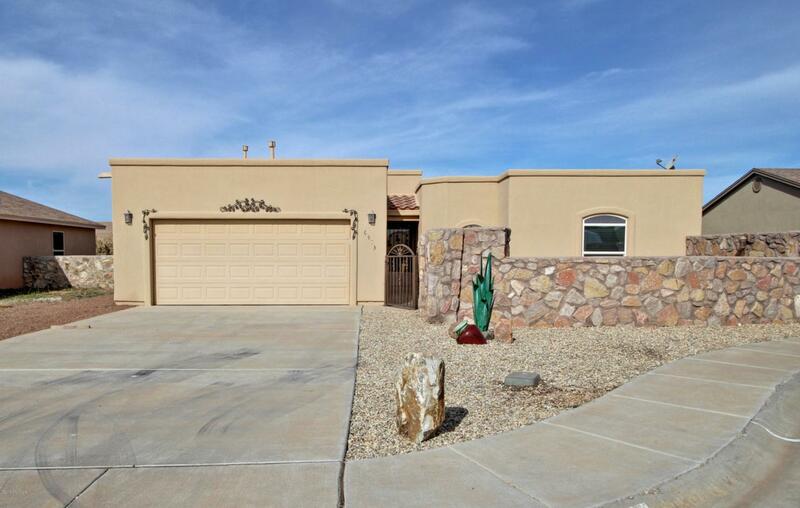 This immaculate, move-in ready home is a must see, close to White Sands, NASA, schools, and Hwy. 70! Don't let this one pass you by, 3 large bedrooms with walk-in closets, 2 large bathrooms, with a spacious open floor plan! 18'' sealed tile everywhere except the bedrooms that have newer carpet. Large baseboards, over-sized shower in master bathroom with slate tile. 2'' blinds throughout, and ceiling fans in all bedrooms. Large kitchen with cherry wood cabinets, sealed tile counter-tops and back-splash, a breakfast bar with room for 6, a walk-in pantry, and stainless steel appliances. The courtyard in the front has a custom iron gate, stamped and dyed concrete, proper drainage, electricity, and dimmer lights, with a beautiful view of the Organs, and the backyard has an extended patio. The front door has a custom security door. The extra-large finished garage has an insulated garage door, and shelves for storage. Xeriscaped front and backyard for low maintenance. Call today for a showing! Listing provided courtesy of Carol T Baugh of Keller Williams Realty: (575) 527-0880. All listing information was provided by Southern New Mexico Multiple Listing Service.